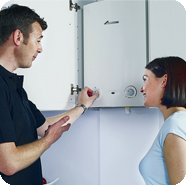 Having your boiler serviced annually helps you to maintain it in good working order and to prevent faults developing that could lead to gas leaks, fires and carbon monoxide poisoning as well as costly repairs. An annual service is also required by most manufacturers’ warranties. Operation of boiler to id? A Powerflush involves flushing out your pipes and radiators with a mixture of water and chemicals to remove the sludge (mix of rust, limescale and similar) that can build up inside them over time. System filters may also be fitted to collect any residual debris left in the system. At the end of the procedure a chemical inhibitor is added to prevent the further build of sludge in the future. A Powerflush can significantly increase the energy-efficiency of your Central Heating System helping you to save on your energy bills. Less sludge means that your Central System doesn’t have to work so hard and that there is a reduced risk of any leaks and resulting damage. If you’d like to book a check-up or repair, or to find out more about a Powerflush or Boiler Service by one of our Gas Safe-registered engineers, why not call us on 01228 598000 or contact us.